Nosebleeds can occur randomly or as a result of an injury. Young children are often affected following activity, colds, or exposure to high altitudes. Nosebleeds are more of an annoyance than a serious injury, most of the time. Nosebleeds happen more during the colder winter months when upper respiratory infections are more frequent, and the temperature and humidity fluctuate more dramatically. Though, if there’s profuse or prolonged bleeding, they can be dangerous and a doctor needs to be consulted. Leaders, camp counselors, and parents should always be aware if they’re supervising a child with a history of being prone to getting nosebleeds. Don’t be afraid to ask parents about their child’s medical history before going camping or taking trips away from your usual meeting place. The most common cause of nosebleeds is drying of the nasal membranes and this can be prevented with proper lubrication of the nasal passages and not picking nose. Have the affected person remain quiet and lean forward slightly with the head tilted forward. 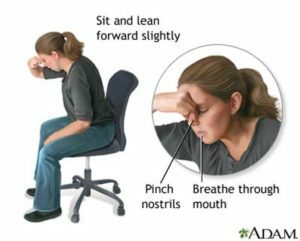 Leaning back or tilting the head back allows the blood to run back into your sinuses and throat and can cause gagging or inhaling the blood. Pinch the nostrils together with slight pressure. If there’s a good amount of blood, you may want to pack the nostrils lightly and then pinch. Hold for at least 5 minutes. Sometimes a cold wet towel, applied to the face, can help to stop the bleeding. For more, consult the American Red Cross.